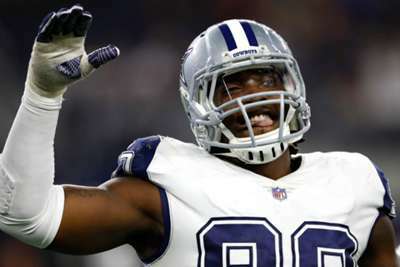 The Dallas Cowboys have agreed on a five-year deal with defensive end DeMarcus Lawrence, the team's website announced on Friday. The deal is for $105 million with more than $65 million in guarantees. "I'm good. The Cowboys already know what it is," he was quoted as saying by the Dallas Morning News. "They know where I want to be. I got big goals, not just for me but us as a team and as an organization. I love being a Cowboy." Lawrence has tallied 25 sacks over the last two years with Dallas. The Cowboys placed the franchise tag on him for the second year in a row in March after he indicated he would not play under the tag in 2018. This is the first of what should be a few extensions for the Cowboys coming up in the next couple of years. Wide receiver Amari Cooper and quarterback Dak Prescott are coming up on the final year of their respective deals, and running back Ezekiel Elliott could be extended soon in the last year of his four-year rookie contract.